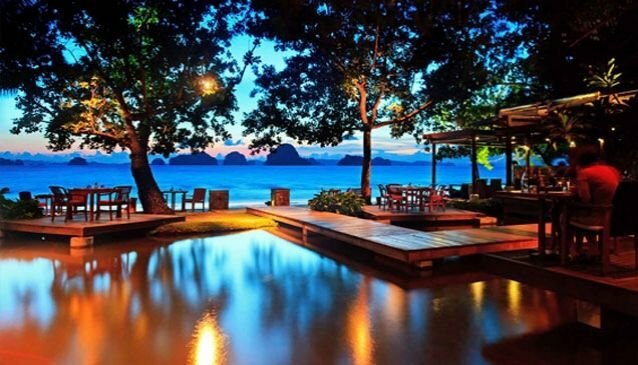 The luxurious and exclusive hotel The Tubkaak Krabi Boutique Resort is located on a secluded beach, Tubkaak, and looks over the islands of Phang Nga Bay including Koh Yao Yai and Koh Yao Noi. Guests can witness beautful sunsets against the limestone monoliths and cliffs, truly romantic moments and testimony to one of the reasons why The Tubkaak Krabi Boutique Resort in Krabi is a member of the list of '1000 Places to see Before you Die ®'. The hotel also, for many years, has been awarded Outstanding Environment, Design and Best Romance Hotel. The rooms, suites and pool villas of the hotel are situated on Tubkaak Beach, which means 'home for visitors' and the Hang Nak Mountain in the background, which blend in to the natural environment.